As a designer operating in the advertising industry, you need expressive fonts to complement your designs and increase the ad’s chances to engage and convert. We know that searching for the right font can sometimes become an adventurous quest dotted with obstacles and challenges. That’s why we’ve compiled a list of the best 50 fonts, so you can easily find a great font that matches your brand’s personality. Our selection includes both the best free but also paid fonts, (ranging from as low as $10 to $25) because we really want to provide you with the best options out there. If you’re using Bannersnack, or plan to, you can upload and store your fonts in your Library. Thus, they will always be available for you when you’re working on your designs. And now, let’s see the fonts. 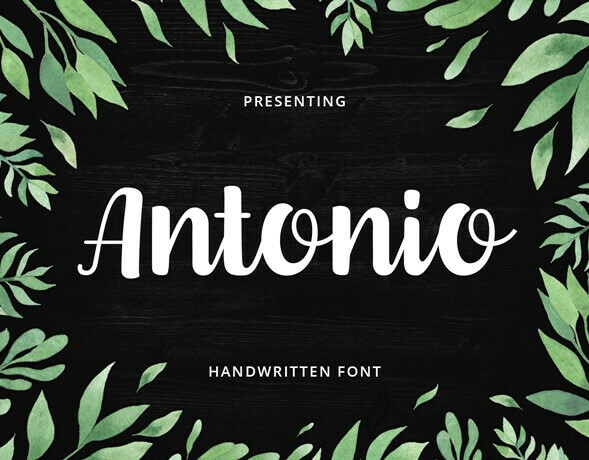 Personality: This curly stroked, handwritten brush font has a unique and dynamic personality. Snowboarding is modern and cool, and it can help you make your message pop and matter. Suited for: sports brands and activities and it goes well in headings as well as in calls to actions. 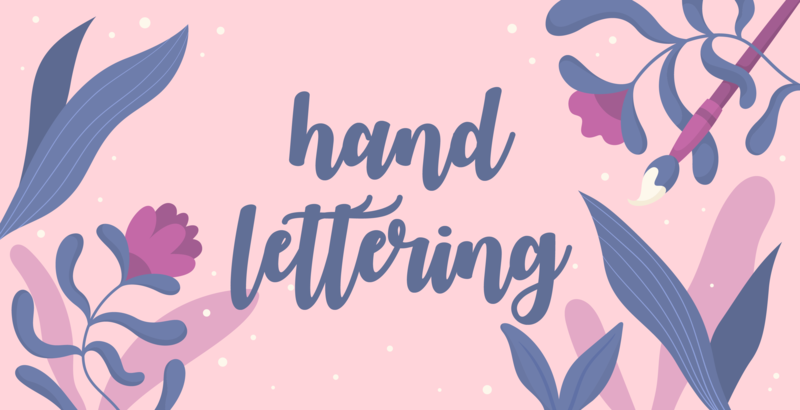 Personality: This is a beautiful hand-lettered brush font that can successfully add warmth and friendliness to your marketing materials. 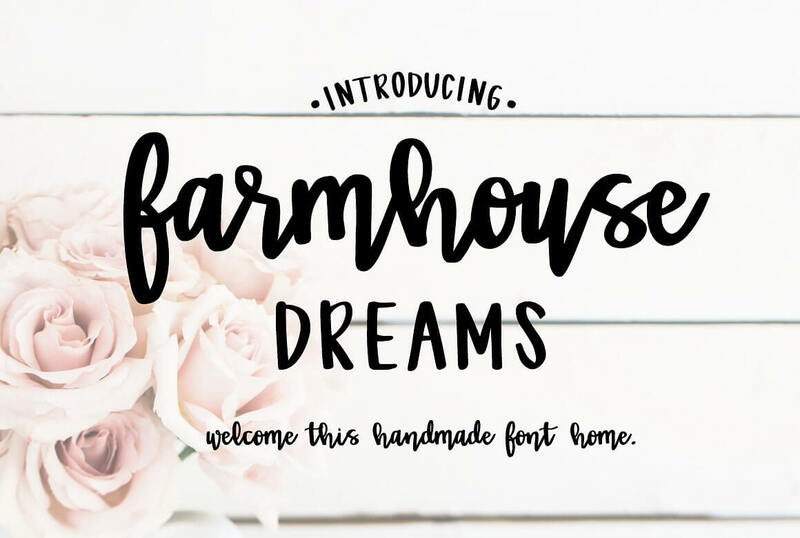 It was inspired by the designer’s love for hand-lettering, southern charm and her dream to one day own a farmhouse. Its uneven lettering size and spontaneous strokes imitate real handwriting and build a cozy, familiar atmosphere. This font comes as a duo pack with both lowercase and uppercase versions. You can play with both of them to create a timeless feel. Suited for: website branding, display banner ads, stationery, packaging, magazine layouts, prints, DIY home decor. 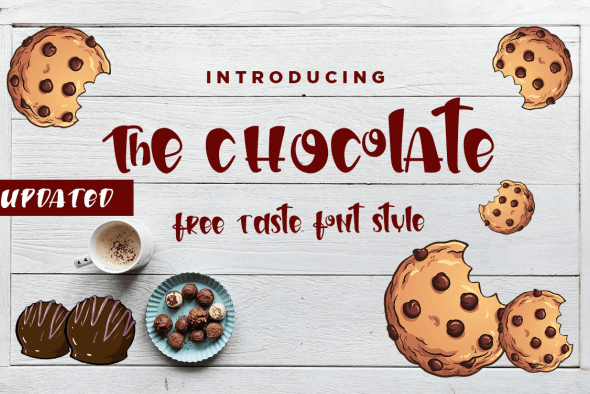 Personality: This clean hand lettering font will add a vintage touch to your advertising materials. The pack comes with a hand-lettering font and a clean uppercase one that complete each other. You can use it for outstanding headings or for your logo. Either way, it will convey a sense of distinctiveness. Suited for: logos, name card, magazine layouts, invitations, headers, or even large-scale artwork. 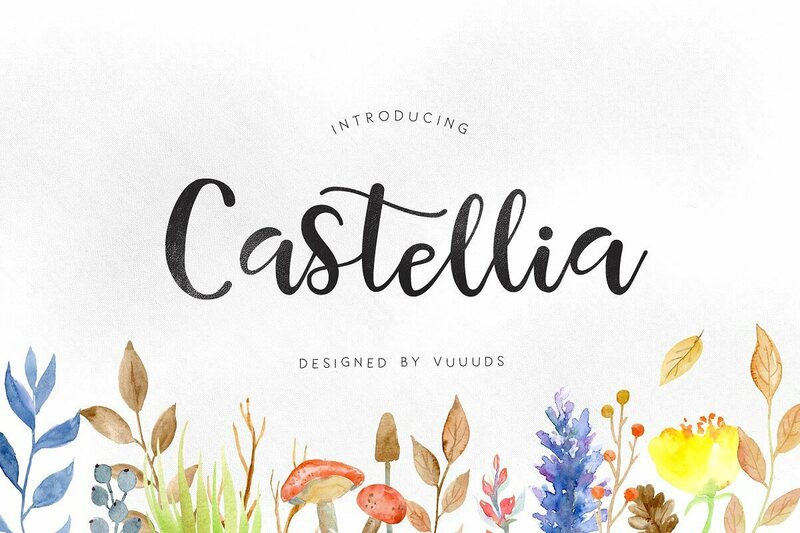 Personality: Each of Castellia’s letters has been crafted to convey friendliness and positivity. With a moderate brush width and an elegant vibe, this font is great for weddings, anniversaries, women’s and children’s brands. Suited for: quotes, banners, blog header, posters, weddings, branding, logo, fashion, apparel, letters, invitations, stationery. 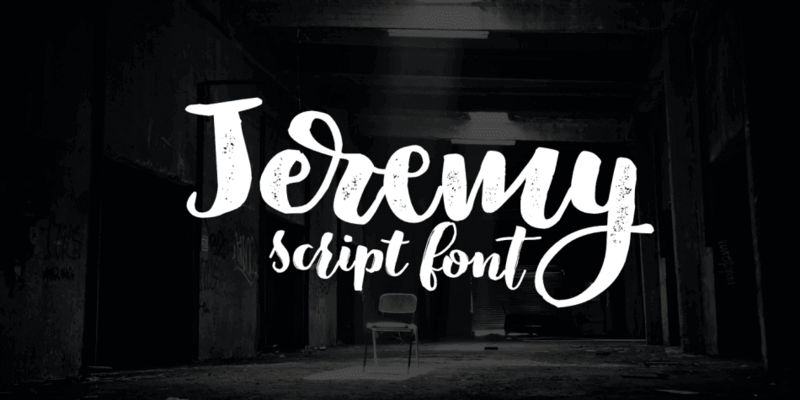 Personality: Jeremy is a playful and modern handwritten brush script that enables you to create a positive and cheerful experience for your audience. Jeremy allows multiple ways to build your message as every lowercase comes in three variations. The thick brush lettering ensures your text will get noticed. Though handwritten, it is extremely legible, and it’s perfect for headlines or as a banner font. Suited for: children and teenagers’ brands, quotes, display banners, posters, brochures, Social Media posters, and ads. Personality: This upright script is perfectly legible for both online and offline media. It is neat and clear and pops. The superbly drawn uppercases will grab anyone’s attention and ensure your message gets read. Suited for: any bold brand, holidays advertising campaigns (Christmas, Easter), posters, display banners, Social Media posts and ads, brochures and catalogues. 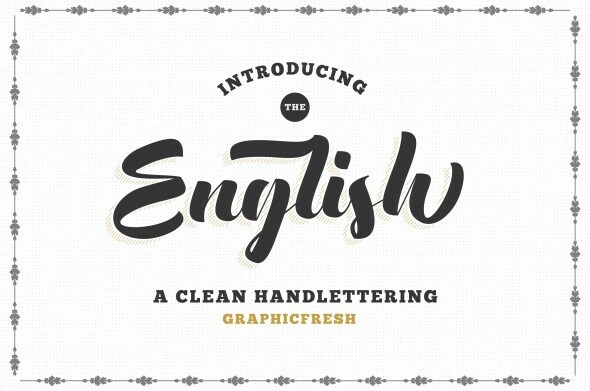 Personality: This simple and clear hand lettering font will enliven any design. 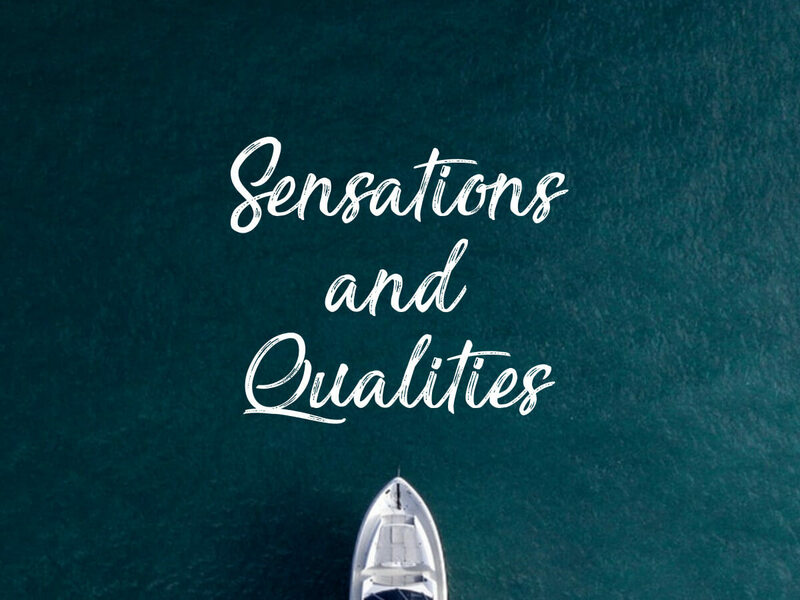 With fluid strokes and elegant uppercases, Sensations & Qualities will help you deliver your message in a stylish way, and you can rest assured you’ll make a great impression. Suited for: women’s brands, holiday campaigns, weddings, anniversaries and other events, posters, display banner ads, Social Media posters. 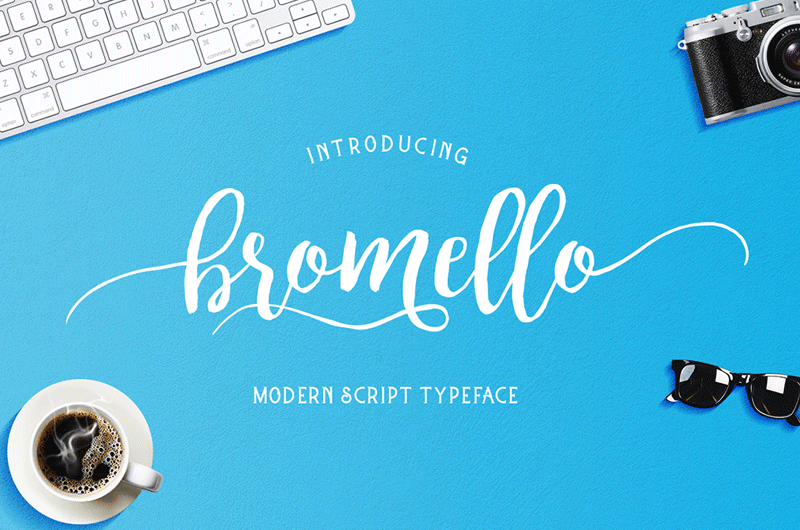 Personality: Bromello’s effervescent personality will help you create outstanding designs and successfully communicate your brand’s message. With modern and playful letters, this font is perfectly suited for children’s and women’s brands. Suited for: weddings, anniversaries and other events, Social Media posters and ads, print posters, brochures and catalogs, display banner ads. 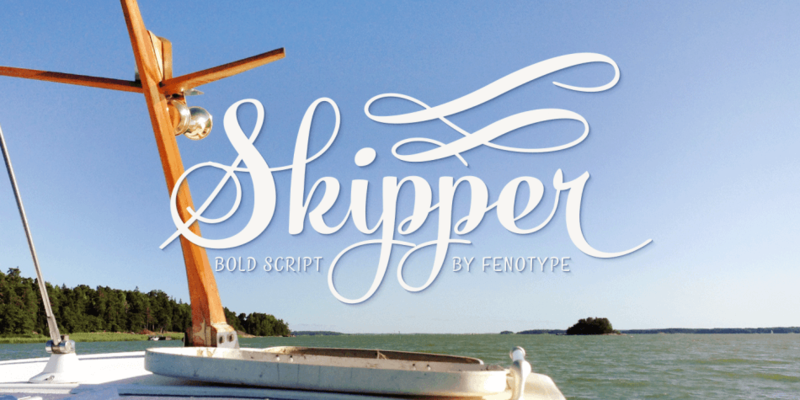 Personality: This bold handwritten font works great for headlines and logos. The thick brush is a sure win when it comes to attention-grabbing, while the playful swirls deliver a positive experience. Suited for: headings, packaging design, posters, flyers, logos, banner ads, prints, brochures. Personality: This classy calligraphy font is excellent for luxury brands, wedding invitations and other special anniversaries. It is reminiscent of that 19th-century aristocratic life, thanks to its thin and swirly uppercases, and it can provide your designs with a touch of class too. 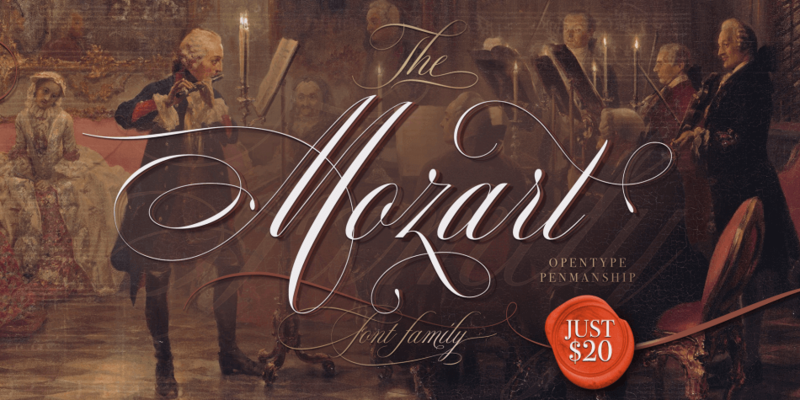 The Mozart font offers extra flexibility and creativity opportunities as every letter has 20 or even 30 versions. Suited for: luxury brands, wedding invitations and other special anniversaries, posters, flyers, banners, catalogs, brochures. Personality: Inspired by Victorian calligraphy, the Rochester font is perfect for when you want to add a touch of class to your brand’s marketing materials. 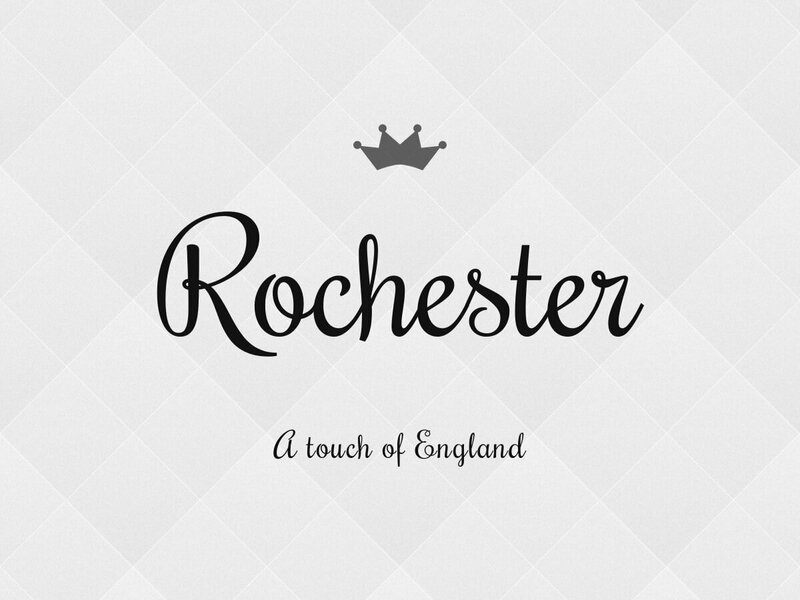 Upright, elegant and not overly sophisticated, Rochester can help you step up your game. Suited for: logos, headlines, posters, flyers, brochures, banners, correspondence materials. Personality: Champagne is a simple and elegant font that can successfully be used for a wide variety of messages and brands. 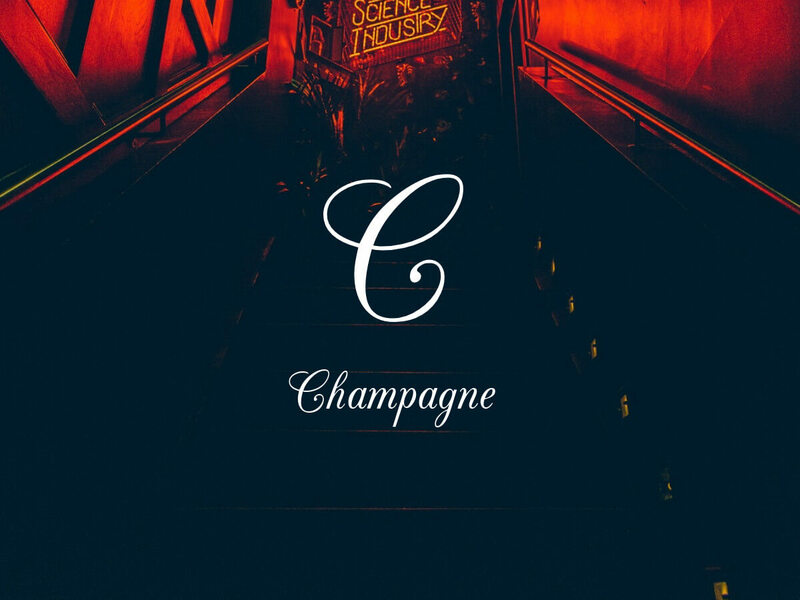 Neat and calligraphic, Champagne will create a classy atmosphere on any design. Suited for: premium brands, weddings, anniversaries and other special events, logos, headlines, posters, flyers, brochures, banners, catalogs. 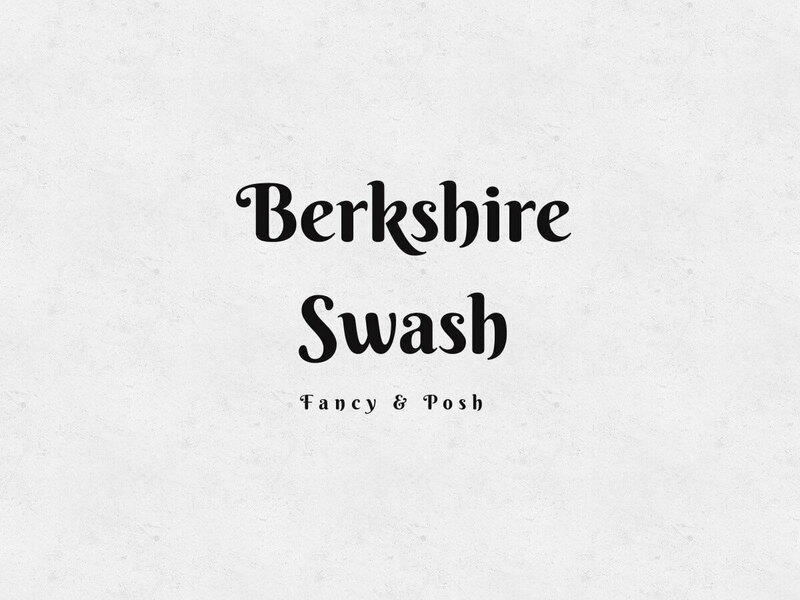 Personality: Berkshire Swash invites the reader into the atmosphere of the exclusive world of the early 20th century high-class. Upright, dignified and sumptuous, this font is all about elegance. Suited for: logos, headlines, posters, flyers, brochures, banners, Social Media posters, and ads. 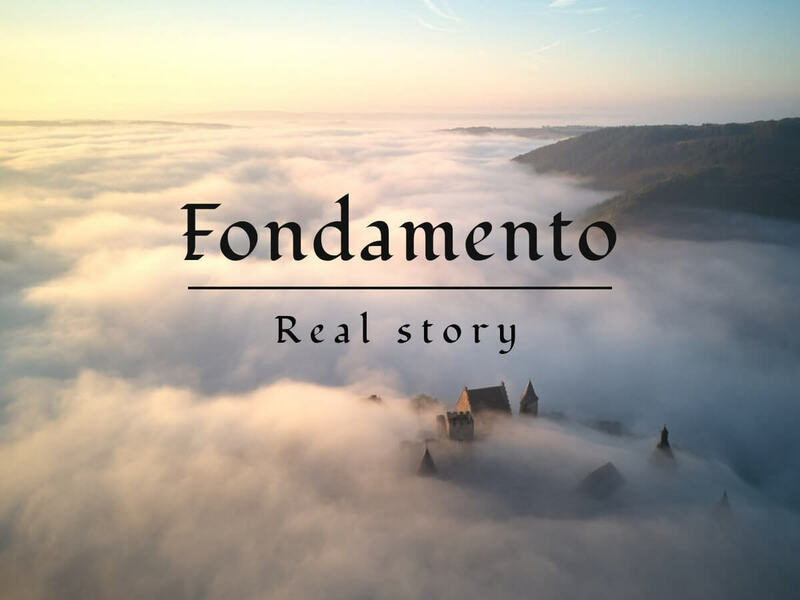 Personality: Inspired by the late 18th-century Enlightenment movement, this font is easily legible and will provide your designs with an extra classy character. This font is clearly formal, suited for luxury brands or high-class events. Suited for: logos, branding materials, invitations, brochures, catalogs, flyers, banner ads. Personality: This curly calligraphic font is a great option for brands who want to look classy but still modern, without the need to go back in history. The stylish uppercases provide an elegant touch, while the polished lowercases keep the text legible. Suited for: women’s brands, travel agencies, weddings and other events, flyers, invitations, brochures, banner ads. 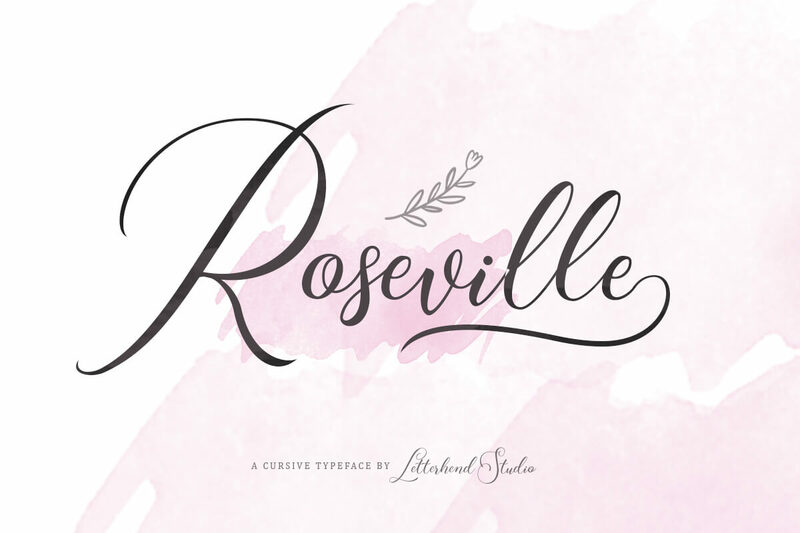 Personality: Roseville is a feminine, romantic font that will brighten any logo or headline. The lovely italic swash uppercases will provide your designs with a touch of elegance. Suited for: weddings and other special events, logos, headlines, branding, packaging, invitations, flyers, catalogs, banners. Personality: With ornamental uppercases and feminine, playful lettering, this is the ideal romantic font. 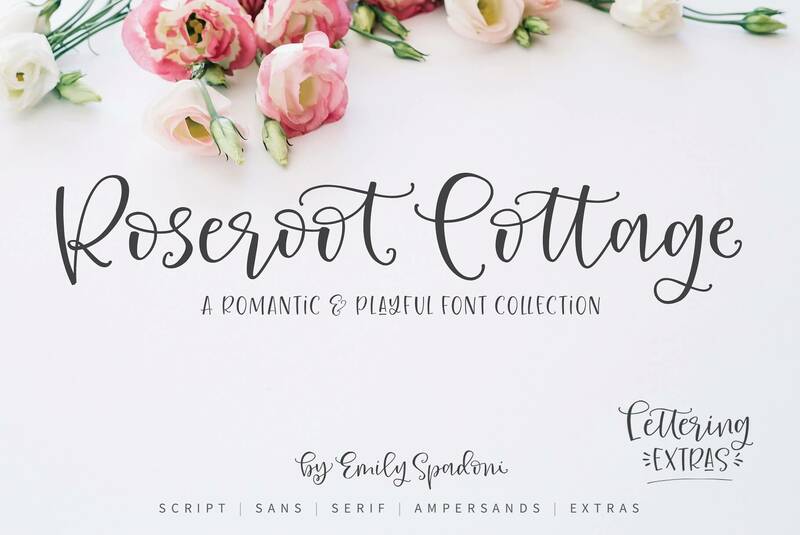 Sweet and dynamic, Roseroot Cottage imitates imperfect handwriting. Suited for: greeting cards, wedding materials, logos, branding, packaging, flyers, brochures, catalogs, banner ads. 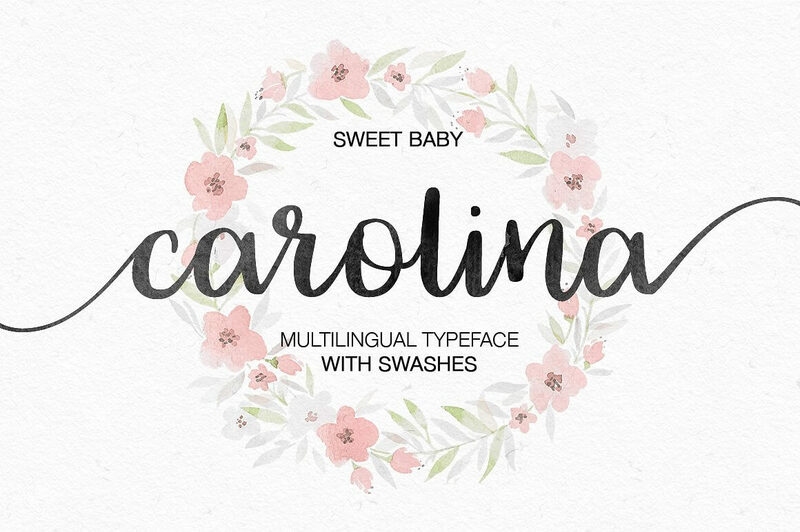 Personality: Carolina is a sweet and delicate handmade calligraphy font. Without being overly ornamental, Carolina is still a romantic font that can successfully go well on your greeting cards, invitations or even branding materials. Suited for: greeting cards, wedding materials, and other special events, branding, flyers, catalogs, banners. 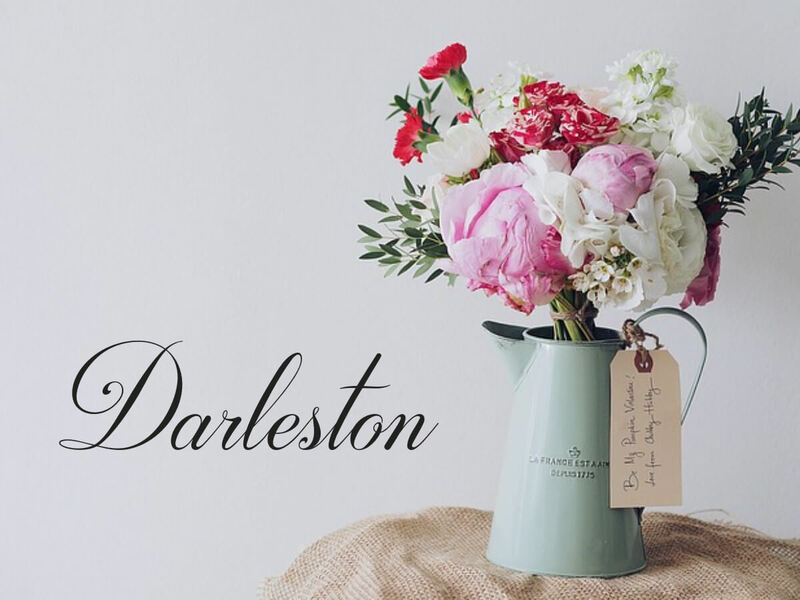 Personality: Darleston is a timelessly chic calligraphy font suited for women’s brands and premium products. The ornamental uppercases will surely make a statement for your brand. Choose this font if you want a beautiful and neat calligraphy font for your brand’s logo or campaign headline. Suited for: women’s and luxury brands, wedding materials, branding, packaging, flyers, brochures and banners. 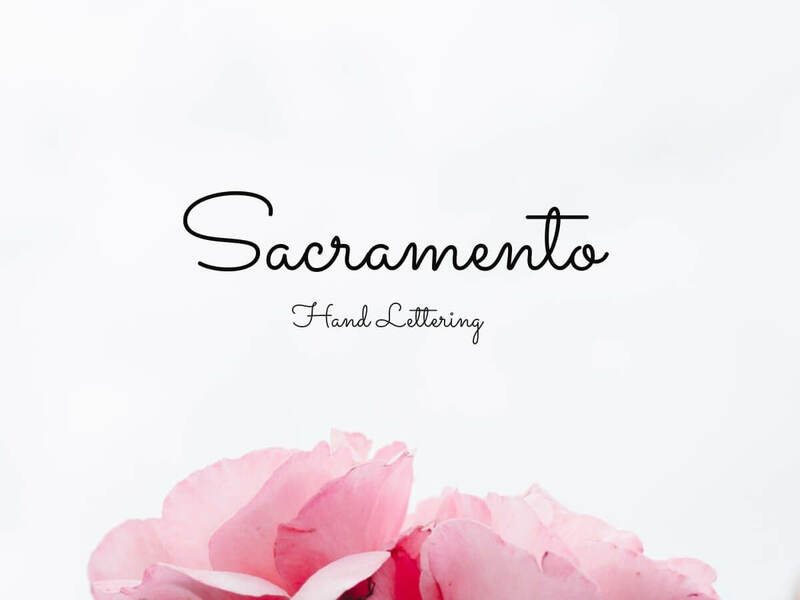 Personality: Sacramento is a semi-monoline delicate handwriting font. It successfully combines swirly uppercases with neat and simple lowercases. The effect is a highly legible font with a feminine touch. Suited for: women’s and girls’ brands, logos, branding, packaging, flyers, posters, Social Media posters and ads, banner ads. Personality: Though rounded body, this hand lettering font is still a romantic option for greeting cards, wedding materials, women’s and girls’ brands. 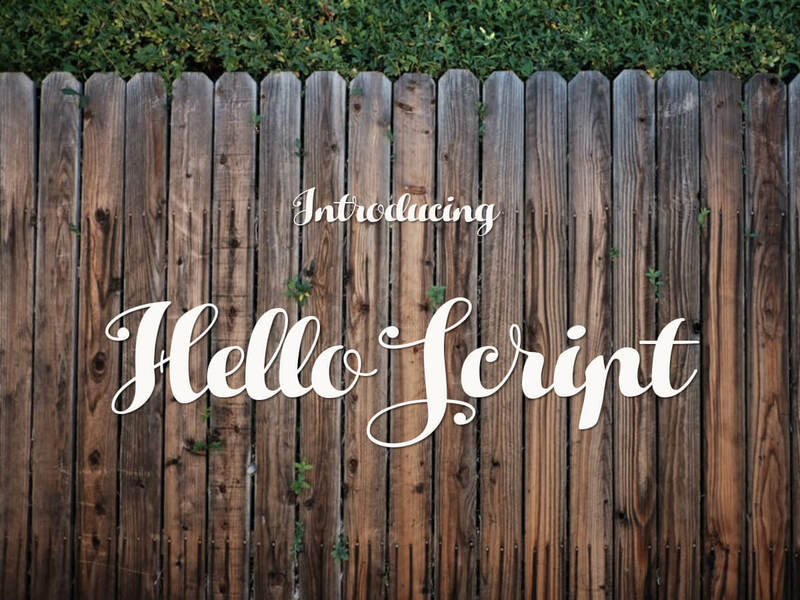 With swirly swashes and brush width variations, Hello Script is playful enough to cheer up any design. Suited for: girls and women’s brands, cards, weddings materials, branding, packaging, Social Media posts and ads, seasonal campaigns (Christmas font). Personality: At times playful, at times overly sensitive and romantic, Skipper is a unique combination. With swirly uppercases and dynamic ligatures, this is a font that conveys positivity and good news. Suited for: women’s brands, premium products, wedding materials, branding, packaging, flyers, brochures, catalogs, banners. 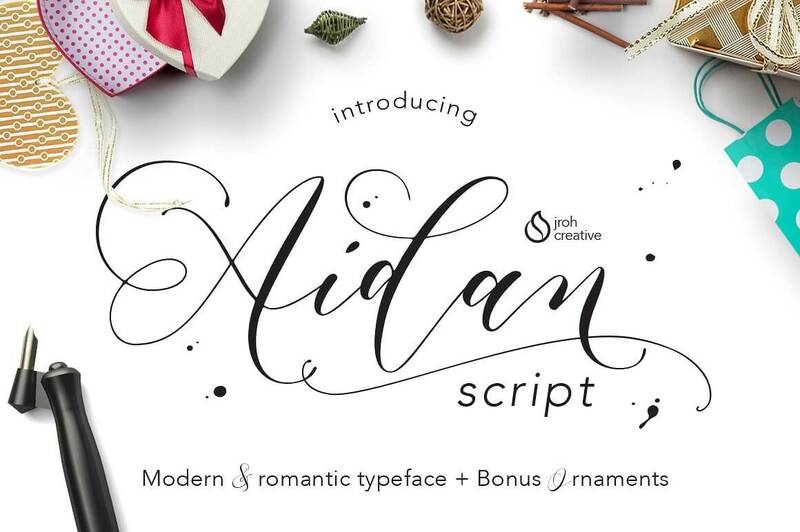 Personality: With curly dramatic uppercases such as these, Aidan is a purely romantic calligraphy font. Though ornamental, this is a modern interpretation of classic romantic fonts. Aidan will ensure a high positive impact on your customers. Suited for: wedding materials, greeting cards, flyers, posters, and brochures. 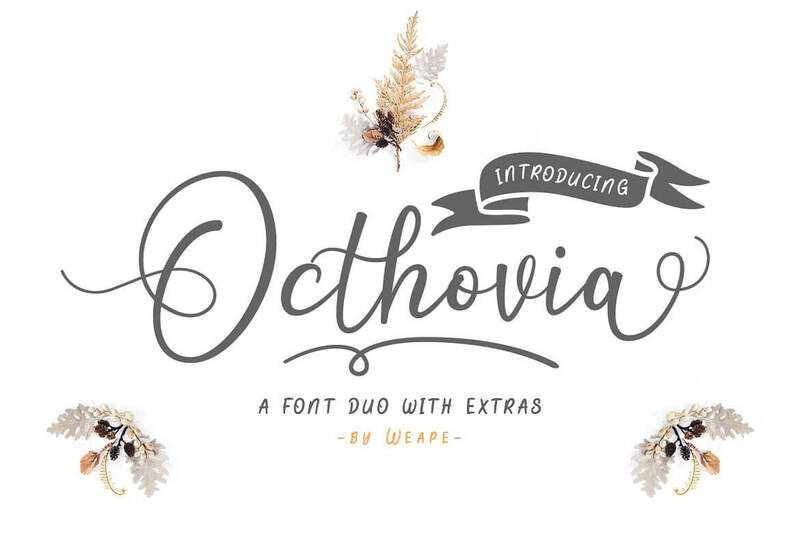 Personality: Octhovia is a modern romantic font ideal for women’s brands’ logos and packaging, wedding materials, and other special events. Inspired by the month of October and vineyards, this hand lettering font works well with fall promotion campaigns. Octhovia will help your message stand out, be heard and melt the hearts of your customers. Suited for: women’s brands, fall campaigns, wedding materials, branding, packaging, flyers, posters, brochures, banners. 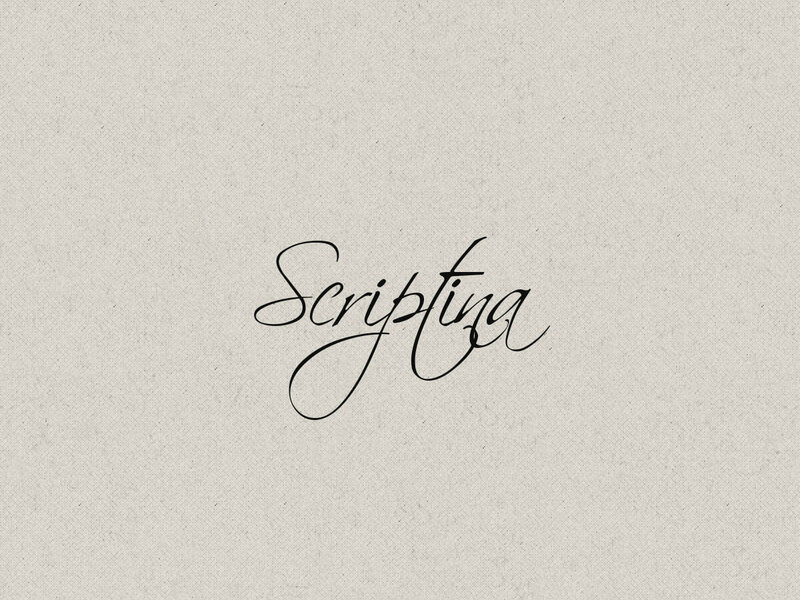 Personality: Imitating calligraphic writing, Scriptina is a great choice for premium brands, weddings or special events. With curls and elongated consonants, this font is a combination of elegance and simplicity. Suited for: luxury brands, weddings, branding, packaging, flyers, posters, brochures, banners. 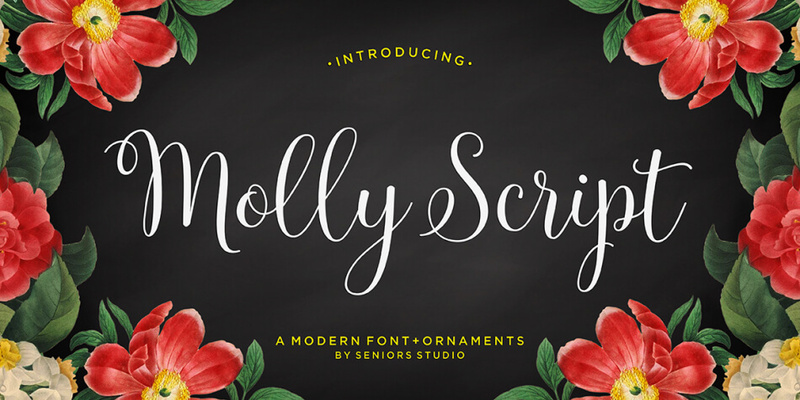 Personality: Molly Script is a modern handwritten calligraphy font with dancing swirls. Lively and romantic, this font will make any message pop. The font pack comes with extra ornaments which allows you to create truly romantic designs. Suited for: weddings, branding, packaging, stationery, menus, Social Media posts and ads, labels, banner ads. 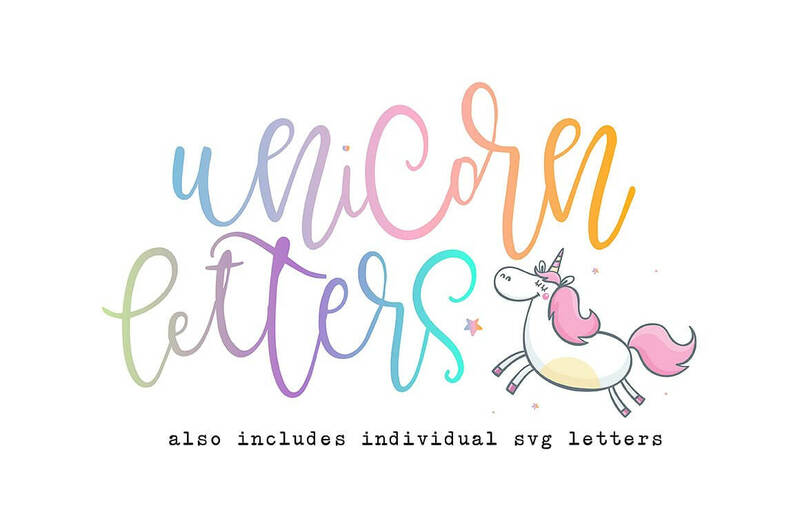 Personality: Unicorn Letters is a bouncy and playful little handwritten font. It conveys positivity and cheerfulness and it’s a great choice for children’s brands or special events invitations. Suited for: children’s brands, events materials, posters, flyers, brochures, Social Media posters, packaging design. Personality: This jolly handwritten font reminds us of our carefree childhood days. 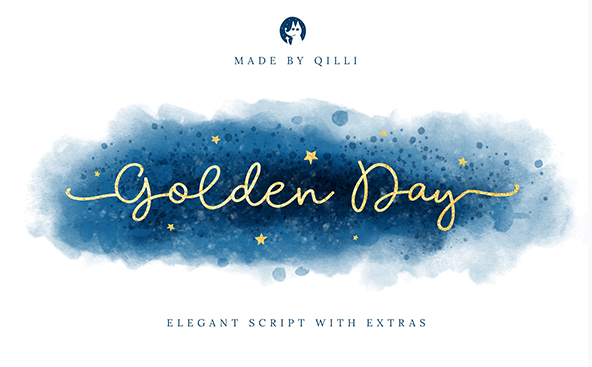 Golden Day tries to imitate a child’s imperfect and spontaneous handwriting. With playful uppercases and wide ligatures, this font is all about the joy of life. Suited for: children’s brands, stationery, cards, logos, branding, packaging, Social Media posts and ads. Personality: Smile, Britannia is here to brighten your day. This playful font will transform your design into a happy little world. The pack comes with a solid font and a sans in both caps and lowercase, which allows you to play around even more. Suited for: children’s brands, logos, branding, packaging, catalogs, flyers, banners. Personality: This exuberant font trio seems to dance all over the layout. And it does. 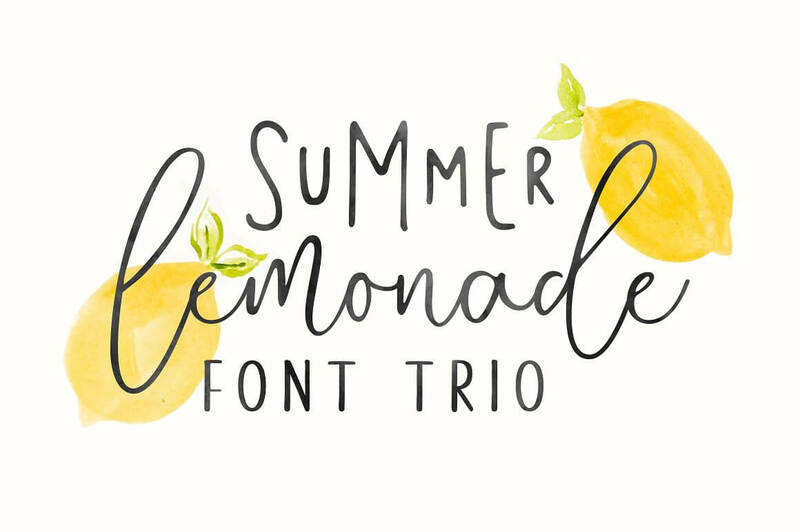 With two uppercase fonts and a bouncy lowercase lettering font, Summer Lemonade is an all-in-one pack able to fill any canvas with joy and meaning. Suited for: children’s and women’s brands, cards, wedding materials, branding, packaging, flyers, Social Media posts and ads. 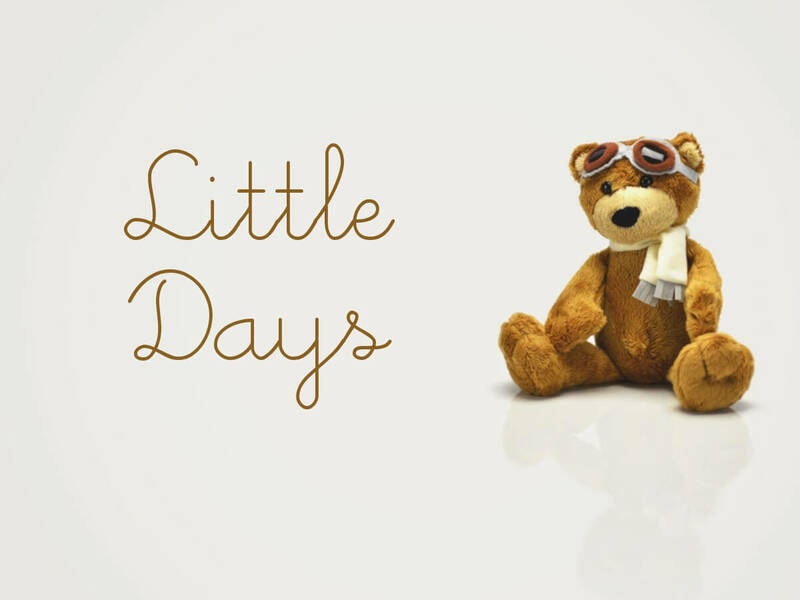 Personality: Little Days is the ideal children’s calligraphy font. Neat, clear and playful at the same time, this font is perfectly legible by both grownups and children. Suited for: children’s brands, cards, branding, packaging, catalogs, flyers, brochures, Social Media posts and ads, labels. Personality: This chunky and playful font will add a touch of fun to your marketing materials. The uneven letters create a feeling of cheerfulness. This font is great for headlines whenever you want to make your text pop. Suited for: children’s brands, branding, packaging, labels, Social Media. Personality: This sweet and friendly font will get your message delivered to your customers. 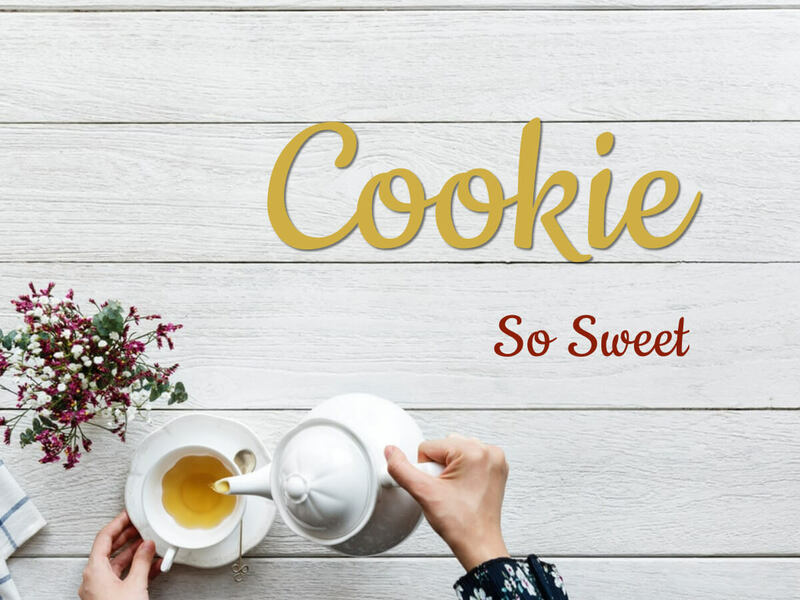 Without being overly decorative or, Cookie is still a charismatic and playful font worth considering. Suited for: women’s and children’s brands, cards, stationery, branding, packaging, Social Media posts and ads. 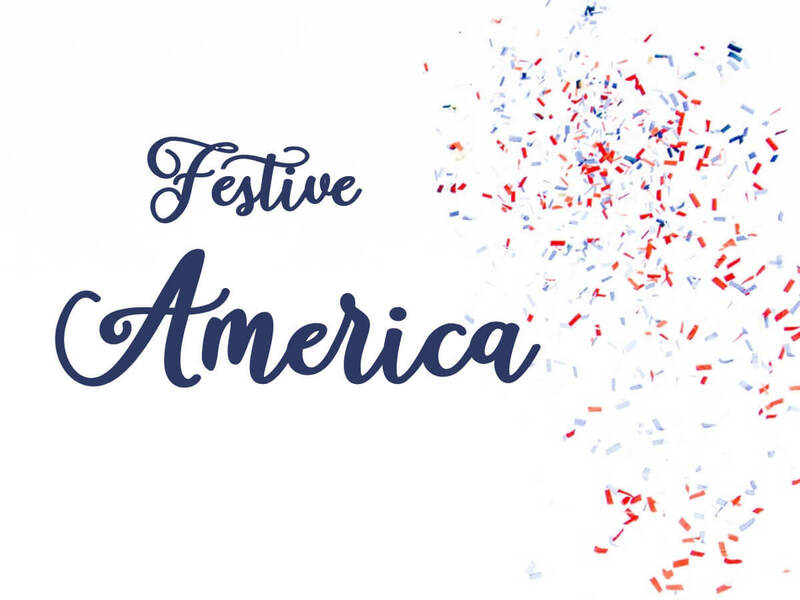 Personality: The uneven letters and curly uppercases make America a beautiful playful font. 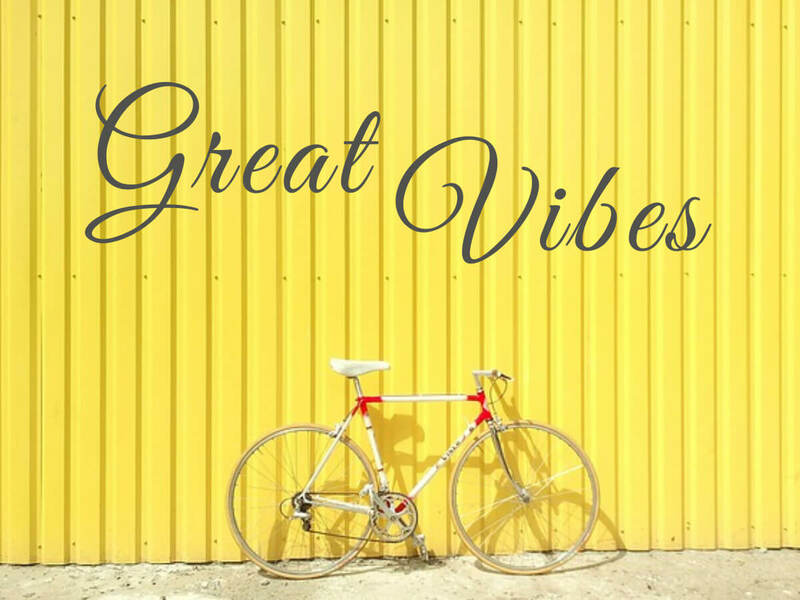 Cheerful and positive, this font can add new meanings to your text and deliver a bright message. Suited for: stationery, cards, branding, Social media posts and ads, catalogs, flyers. 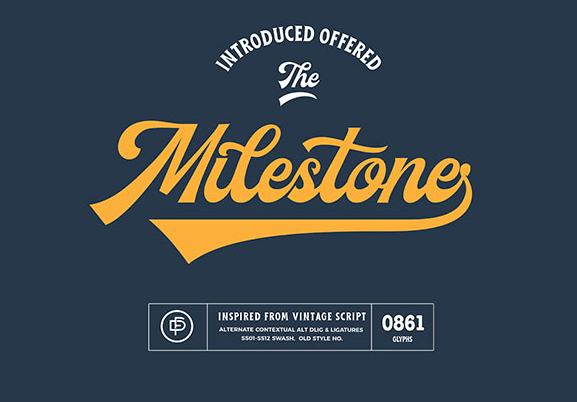 Personality: Inspired by vintage baseball sport, the Milestone font is perfectly suitable for anything with a retro touch, from brands to campaigns. With curled uppercases and tall consonants, this font is quite an apparition. Suited for: cards, logos, branding, packaging, banner ads, Social Media posts and ads, labels. 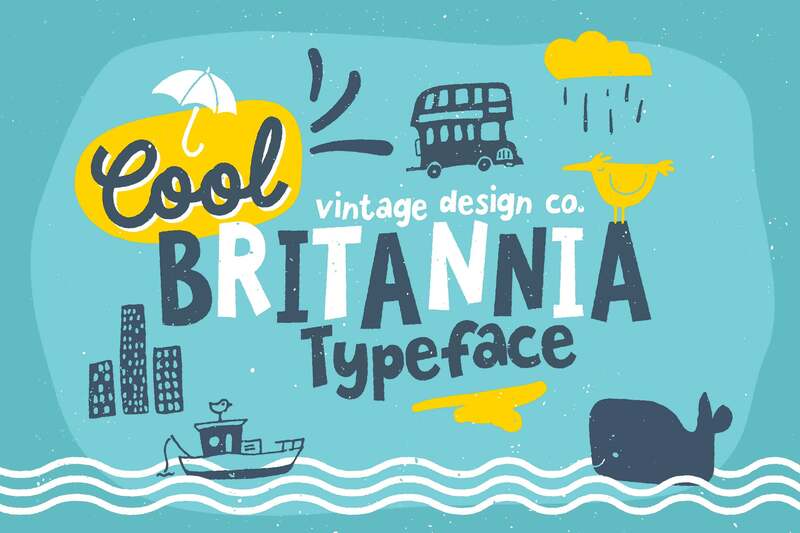 Personality: This bold vintage font is an invitation to the fascinating world of the 60s and 70s. 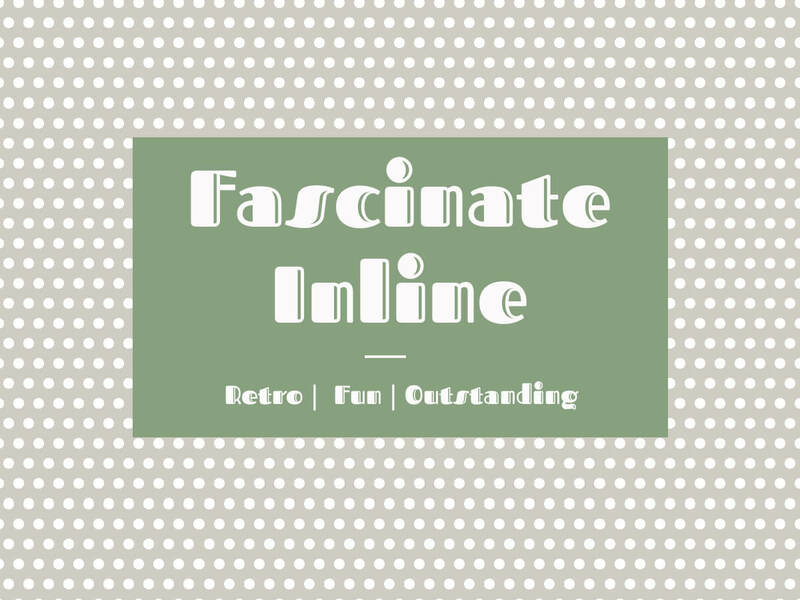 The heavy weight of the font makes Fascinate Inline an attention grabber, while the square-shaped letters keep it highly legible. Suited for: retro brands, stationery, cards, logos, branding, banner ads. 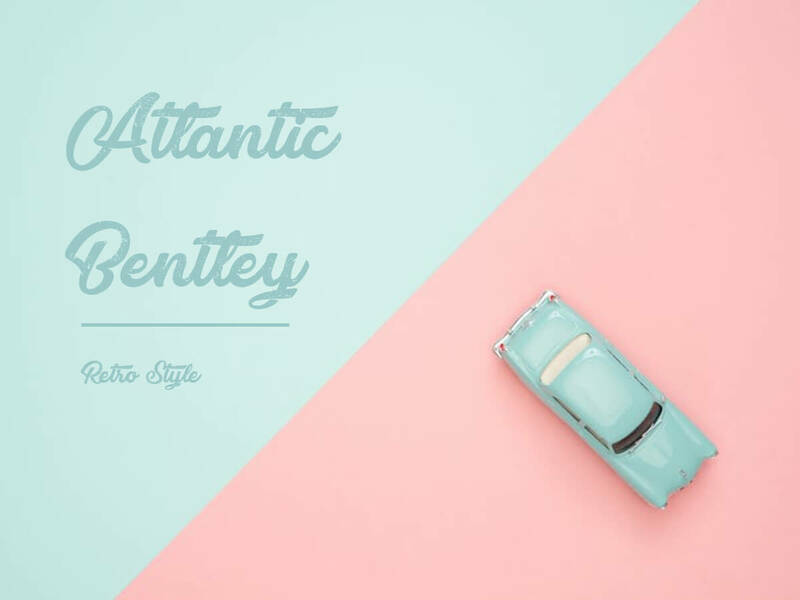 Personality: Atlantic Bentley is that retro thick brushed font you need to have in your design toolkit at all times. This lively font has got that sophisticated retro touch that will make us immediately think of vintage cars, outfits, and pin-up photography. A must-have for all designers. Suited for: logos, headlines, branding, packaging, cards, Social Media posts and ads, banner ads. Personality: What’s great about this retro font is that it comes with multiple versions for each letter, plus various versions of ligatures, which allows you to create font variations for each of your design project. Suited for: logos, headlines, branding, packaging, labels, Social Media posts and ads, posters, flyers, catalogs, banner ads. 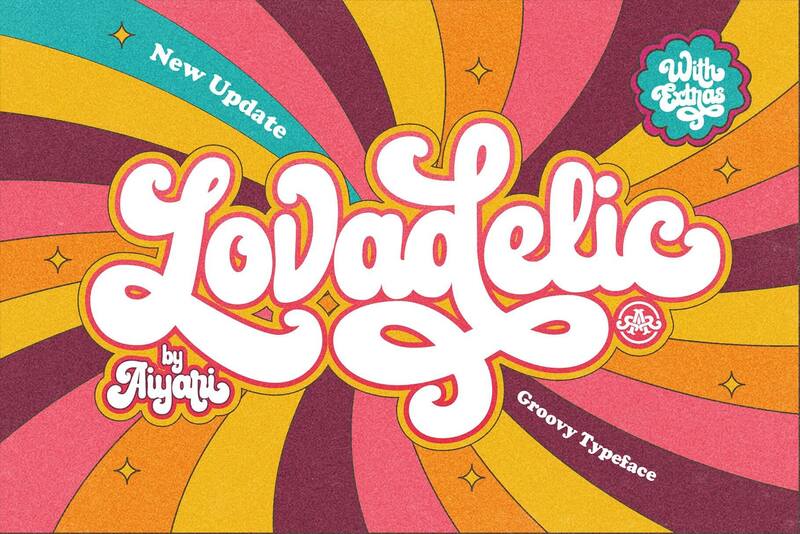 Personality: Inspired by the 1970s disco psychedelic script lettering, Lovadelic is a vintage attention grabber font. With groovy letters and curled uppercases, this is a font that will make your ad stand out. Suited for: headlines, logos, branding, flyers, Social Media, banners. 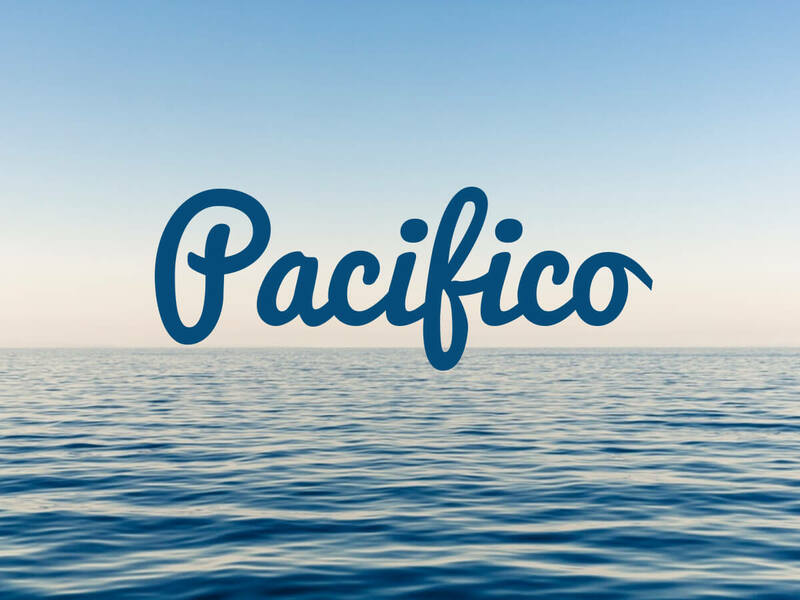 Personality: Pacifico is a slightly retro brushed script. Simple and neat, Pacifico brings an American vintage style. The even lettering provides this font with a good legibility and makes it an excellent choice for logos and campaign headlines. Suited for: headlines, logos, branding, packaging, flyers, catalogs, banners, Social Media posta and ads. 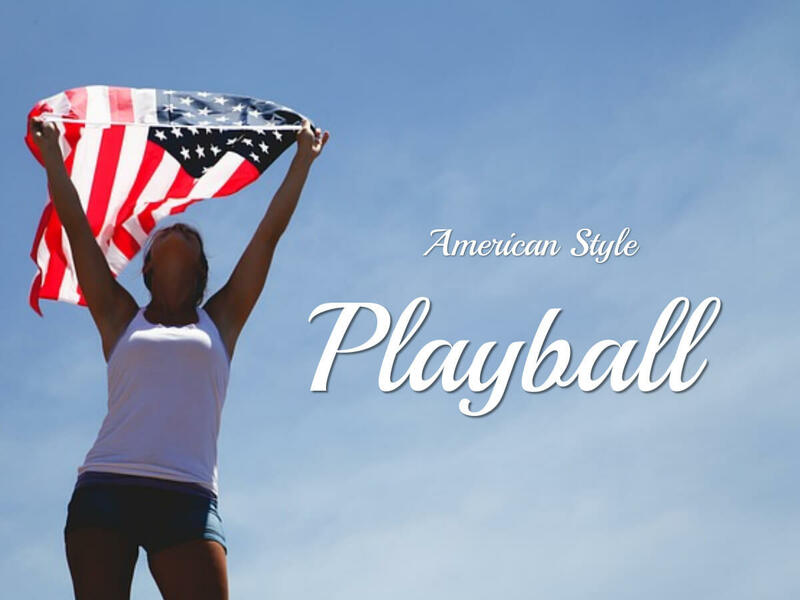 Personality: Playball comes with a slightly retro touch, allowing designers to create ads with a hint of vintage flair. Without useless decorations, Playball is a straightforward retro calligraphy font. Suited for: logos, branding, headlines, flyers, posters, Social Media posts, and ads. 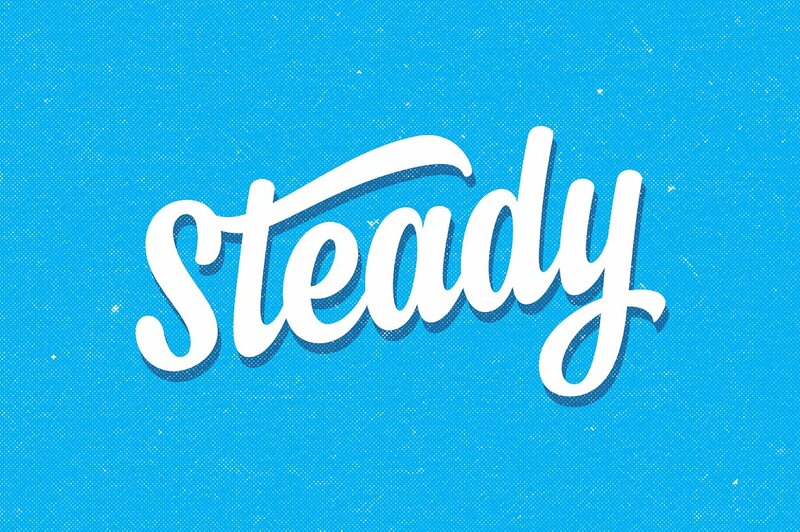 Personality: Steady is a vintage font with a lot of character. Thanks to its clearly defined letters, Steady will successfully convey your message. This font comes with contextual, stylistic and ligatures alternatives which allow designers to play around with text. Suited for: logos, headlines, branding, packaging, cards, labels. 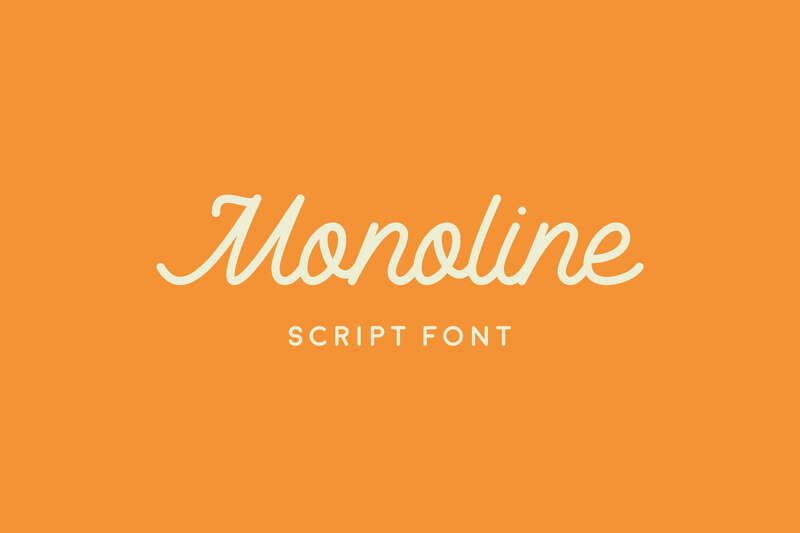 Personality: Monoline is a beautiful mono-line font, perfect for branding design. It is easily legible and it has a handmade feel, resembling somewhat to a tailor’s thread. Suited for: branding, logos, headlines, packaging, labels, flyers, posters, catalogs, menus, Social Media, banner ads. 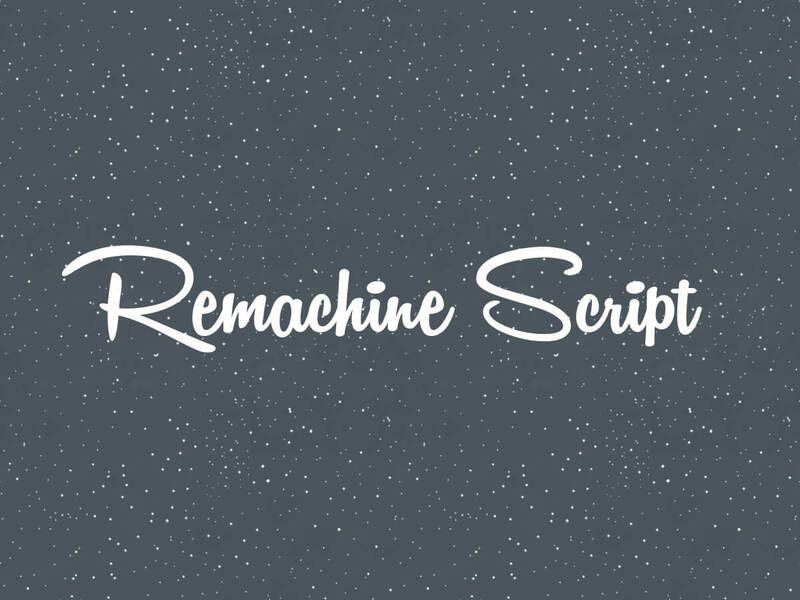 Personality: Dulcelin is a sweet monoline script perfect for ads of all types. 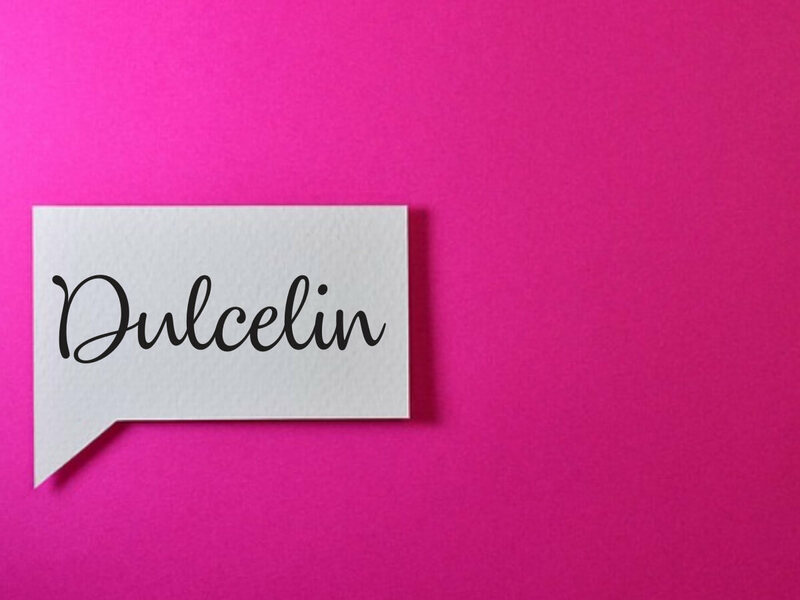 With a playful character, Dulcelin will add friendliness to your message and increase chances to impress and engage. Suited for: headlines, flyers, banner ads, posters, catalogs, brochures, cards, Social Media. Personality: This uppercase handwriting font is a perfect choice for advertising campaigns headlines. Tall, slim and upright, Summer allows designers to create typography-only designs. Suited for: headlines, logos, branding, packaging, labels, cards, Social Media, flyers, catalogs, menus. 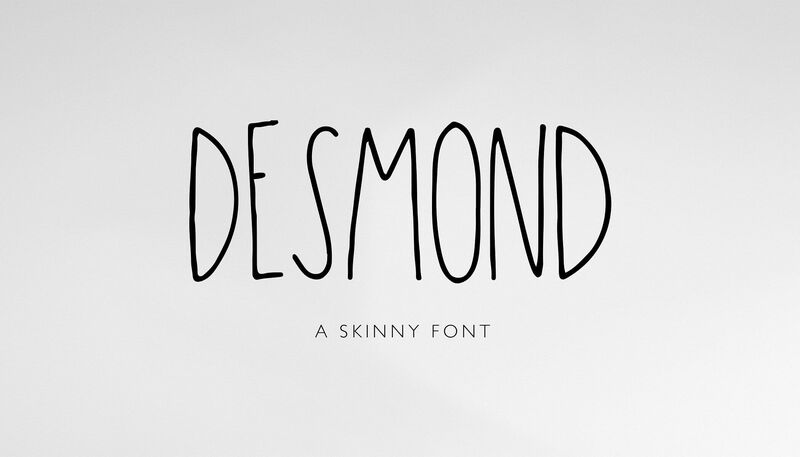 Personality: Whenever you’re looking for a modern skinny-looking uppercase script, Desmond is your font. 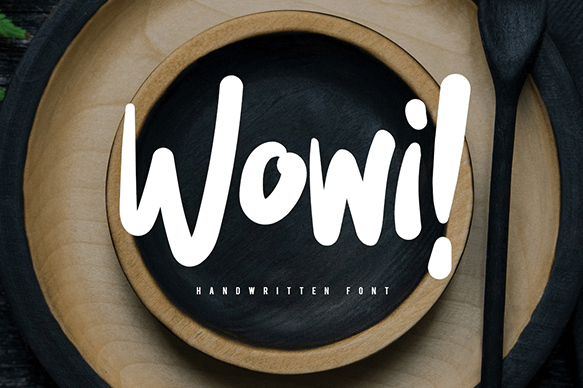 This funny handwritten font is perfect for logos and headlines, especially if you’ve got a kids brand. Suited for: logos, headlines, branding, packaging, labels, menus. 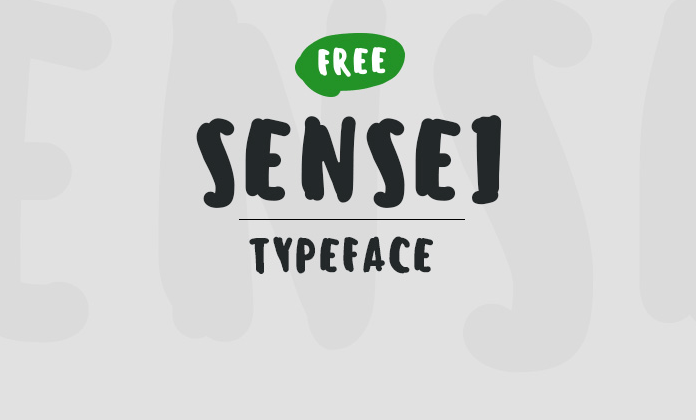 Personality: Meet Sensei, the thick brushed uppercase script. With imperfect brush lettering and uneven alignment, this font makes a perfect catch for designers looking for funny, playful fonts. Suited for: logos, headlines, packaging, labels, cards, display banner ads. Personality: This is a modern handpainted script that allows designers to create texts that pop. Playful and cool, Wowi will surprise and dazzle your audience. Suited for: logos, headlines, branding, packaging, labels, menus, crads. Personality: Follow your own path and stand out from the crowd with the Devious script. 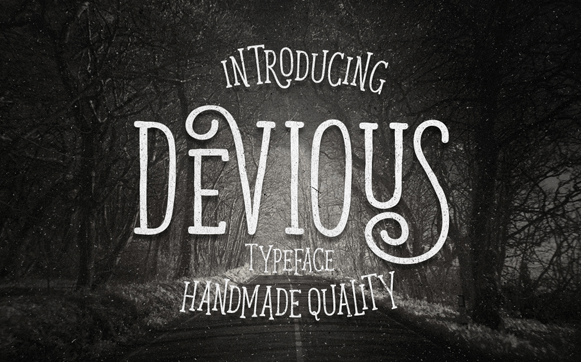 Here is a slim vintage hand-drawn font that will get your message noticed out there. This font comes with multiple characters alternatives so that designers can create amazing letter combinations and deliver stunning visuals. Suited for: cards, stationery, logos, headlines, branding, packaging, labels, Social Media. 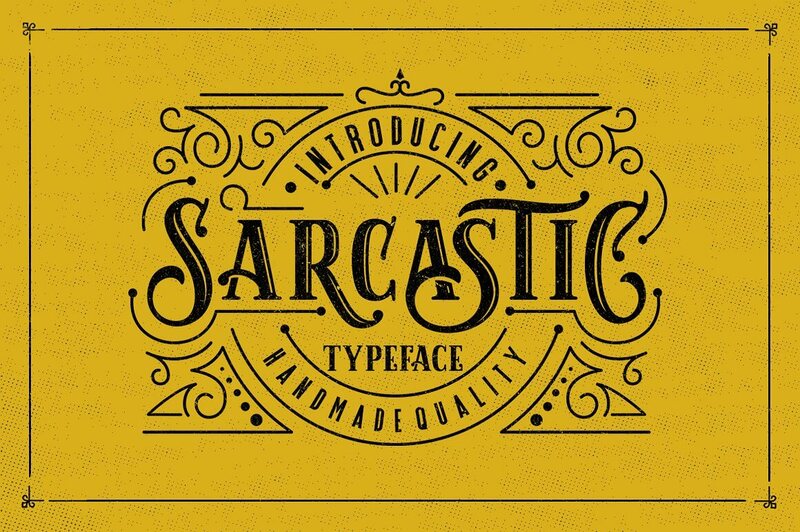 Personality: Inspired by early 20th century Art Deco posters, Sarcastic is a charismatic handwritten uppercase script. Each letter was carefully crafted to artistry with ornaments and surprising swashes. The pack includes multiple letter alternatives and additional swashes and design elements to create unique designs. Suited for: cards, stationery, logos, headlines, branding, packaging, labels, menus, posters, flyers, banner ads. Handwriting is the new Sans! Hand lettering fonts have never been more popular. Living in a 9 to 5 digitalized world, people are craving for that warm, familiar feeling of handmade products, be that food, clothing or typography. And with so many talented designers out there – I dare say – handwriting has never been more charismatic! 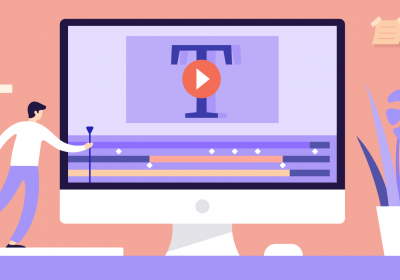 From swirly and bubbly scripts to neat calligraphic fonts, brands can now truly find their hand lettering typeface match, one that can proudly speak for them. 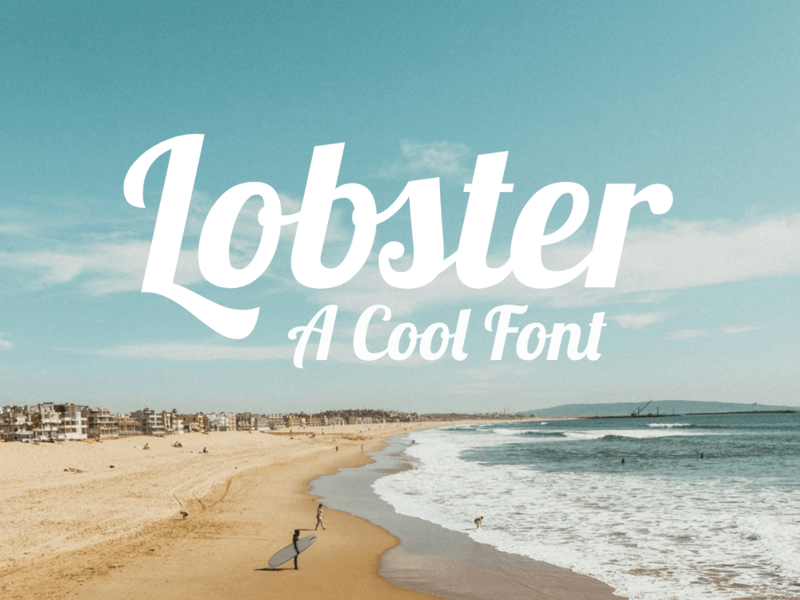 If you’re looking for modern, cool fonts, check out our selection of the best 60 Modern Fonts On The Internet. These Fonts are amazing. I’ll use them.